Apple’s iPad Pro is one of the most attractive and useful devices, but expensive as well. However, it is not without issues. Several users have been complaining lately about screen stuttering issues with their iPad Pro. Affected users have raised the screen stuttering issues with the iPad Pro on Apple support forums and the MacRumors forums. The majority of the complaints are related to the 2018 iPad Pro, but some are facing the same issues with the 2016 and 2017 variants as well. “…after the last two updates my ipad pro 12.9’ 2nd gen has issues with not responsive screen often. I need to exit the application or click the home button multiple times or lock the screen and all goes well after,” one affected user said. Users affected by the screen stuttering issues report several other issues with the iPad Pro as well. The reported issues range from unresponsive touch gestures, keystrokes being missed, and more. As per the users, the screen stuttering issues are more noticable when the display is unresponsive to multiple inputs. For some users, the issue affects overall scrolling while using the display. While some started facing the above issues after using the device for some time, one user said that the issue of unresponsive keys appeared soon after removing the iPad Pro from the box. This specific user said that several alphabet keys on the device were not working as intended. He then contacted Apple Customer Care, but they didn’t have any solution. Even a full restore to factory settings didn’t fix the issue. The user then got a replacement, but it proved even worse. “It seems the bottom right of the touchscreen has an issue,” the user said. Apple has still to comment on the issue. It is not known how widespread the issue is as many 2017 and 2018 iPad Pro models are not experiencing any issue at all. Also, it is not clear if it is a software or hardware related issue. However, many users started complaining about the issue after updating to the iOS 12.2. On the other hand, many facing issues with the 2017 model claim that the issue triggered after the iOS 11.3 update and have remained since then. 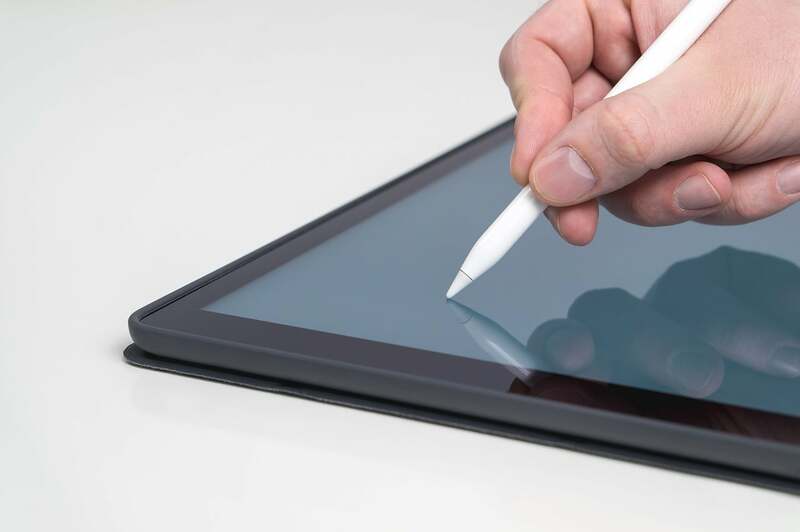 Also, some users say that the issue is automatically fixed when the Apple Pencil 2 is attached to the tablet. But, this trick does not work for all affected users. If you are also facing the screen stuttering issues with an iPad Pro, then you need to contact the nearest Apple Store. There are chances that you may get a free replacement. In separate news, Logitech has revealed the first keyboard for the latest iPad Pro earlier this week. The keyboard, called the Slim Folio Pro, is a viable alternative to the first-party Smart Keyboard Folio, which Apple revealed with the new tablet last year. Apple’s first-party Smart Keyboard Folio uses the iPad’s Smart Connector to connect with the iPad Pro. Logitech’s keyboard connects over Bluetooth LE. This means that you will have to charge the keyboard separately, but you won’t have to charge it frequently. Logitech says the new keyboard would work for three months on a single charge, assuming it is used for two hours a day. Logitech’s last keyboard had a battery life of four years as it comes with a replaceable coin battery. Logitech’s keyboard has a separate row for several iOS shortcut keys along with keys for screen brightness, volume and media playback. It also has a built-in strap to ensure that the second generation Apple Pencil is safe when attached to the iPad Pro. The keyboard automatically turns on when it is connected to the iPad and the user slides it into typing mode. Also, one can fold the tablet to make it suitable for sketching. However, Logitech’s keyboard can possibly be used in only one angle compared to two angles for Apple’s keyboard. Logitech’s keyboard comes in two sizes to match the size of the current iPad Pro models. The bigger one (for the 12.9-inch iPad Pro) costs $129.99, while the smaller version (for the 11-inch iPad) costs $119.99. In comparison, Apple’s folio keyboards are priced at $199.99 and $179.99, respectively. The keyboard is scheduled to ship sometime later this month.